Unverified videos on social media appeared to show thousands marching through the western cities of Khorramabad, Zanjan and Ahvaz in Iran. 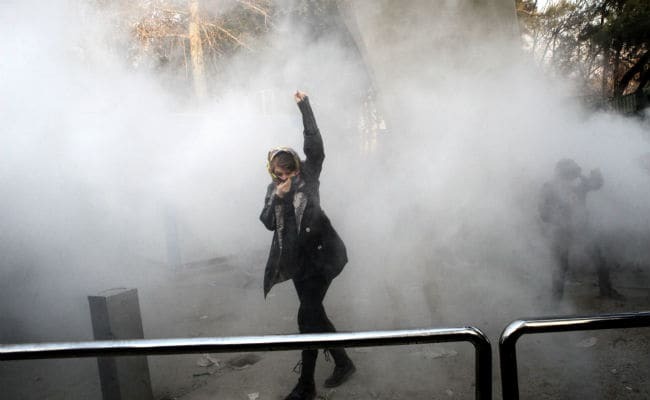 Tehran: Demonstrators attacked a town hall in the Iranian capital Saturday as protests spilled into a third night despite government warnings against any further "illegal gatherings" and moves to cut off the internet on mobiles. Unverified videos on social media appeared to show thousands marching through the western cities of Khorramabad, Zanjan and Ahvaz, while reports spread rapidly that several people had been shot dead by police in the town of Dorud. A swirl of wild rumours, combined with travel restrictions and a near-total media blackout from official agencies, made it difficult to confirm the reports. The authorities appeared to respond by cutting internet access to mobile phones, with the main networks interrupted at least in Tehran shortly before midnight, AFP reporters said. Several Iranian news agencies warned Telegram, the most popular social media service in the country, might soon be shut down after communications minister Mohammad-Javad Azari Jahromi accused one popular channel, Amadnews, of encouraging an "armed uprising". Meanwhile, the conservative Mehr news agency posted videos of protesters attacking a town hall in central Tehran, overturning a police car and burning the Iranian flag. There was chaos earlier around the capital's university as hundreds took to the streets, blocking traffic and shouting slogans against the regime. But the authorities could also count on a show of strength, with hundreds of counter-demonstrators seizing control of the university entrance, chanting "Death to the seditionists". The authorities were also fortunate that annual rallies marking the defeat of the last major protest movement in 2009 had already been scheduled for Saturday morning and brought thousands of regime supporters to the streets across the country. The protests began in the second city of Mashhad on Thursday as an attack on high living costs but quickly turned against the Islamic regime as a whole. State news channel IRINN said it had been banned from covering the protests that spread to towns and cities including Qom and Kermanshah. "The enemy wants once again to create a new plot and use social media and economic issues to foment a new sedition," Ayatollah Mohsen Araki, a prominent cleric, told a crowd in Tehran, according to the conservative Fars news agency. Other officials also pointed the blame outside Iran. US President Donald Trump tweeted later that Iran's people wanted change and "oppressive regimes cannot endure forever". But officials in Iran warned against dismissing the public anger seen in recent days. "The country is facing serious challenges with unemployment, high prices, corruption, lack of water, social gap, unbalanced distribution of budget," tweeted Hesamoddin Ashena, cultural adviser to President Hassan Rouhani.